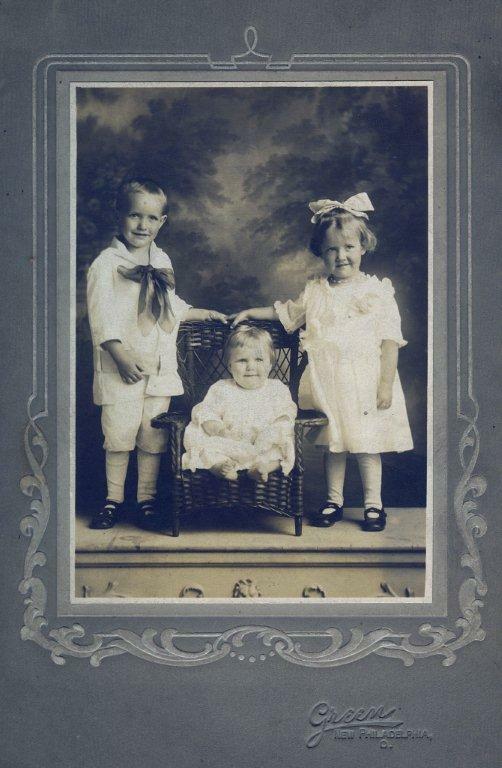 About 1910, clockwise from left, Sherman Foutz, his daughter Grace Foutz, his mother Rebecca Foutz and his grandmother Rachel Caldwell pose in happier times. In this ongoing series, we’re taking a crack at solving some of the mysteries surrounding the family of Sherman Foutz, my great-grandfather Vance Foutz’s oldest brother. 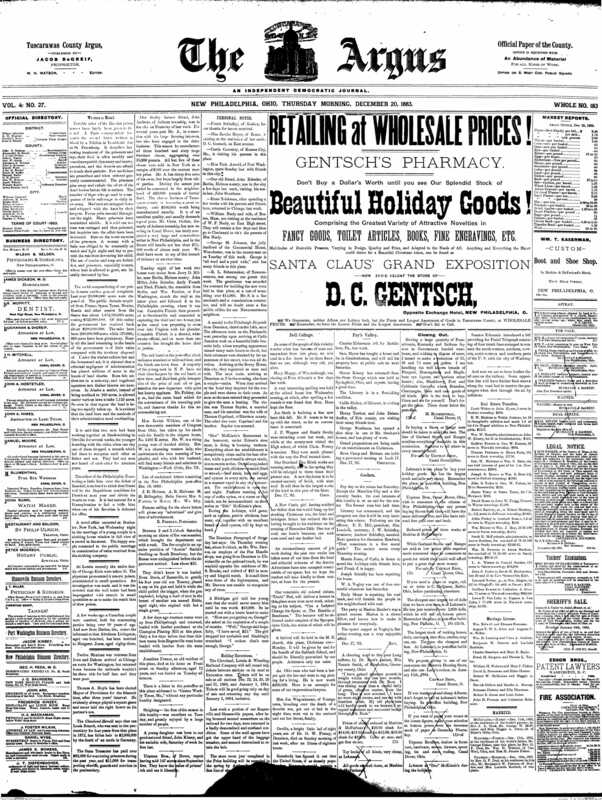 A recent research binge on newspaperarchives.com blew open a couple doors I thought, given Pennsylvania’s reputation for white-knuckle-gripping its vital records, would probably stay shut fast. An illuminating source, as ever, are the obituaries of relatives past. 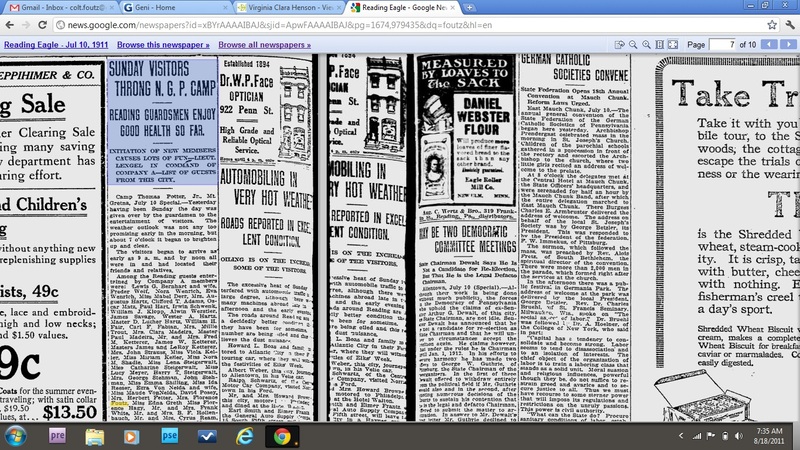 And just in case information is incomplete (or wrong) in the final record of our dearly departed — as was the case in Sherman Foutz’s 1915 obituary, the one clipped and saved for 100 years — it always pays to check the initial “extra” to readers of the day or so before — the death announcement. If I could offer one genealogy lesson — though stories are the point of this blog — it’s that starting from the end of a life often yields the richest clues to an ancestor’s entire life. Obituaries done right, at least the way I was taught as a cub reporter at the Sandusky Register (egad, a decade and a half ago), serve up all the pertinent birth, marriage and death dates; spouses, children, parents, siblings, (living and dead); occupations, places lived, war record; and all the various memberships and associations that make up a life in brief. A treasure trove, if you can get at it. 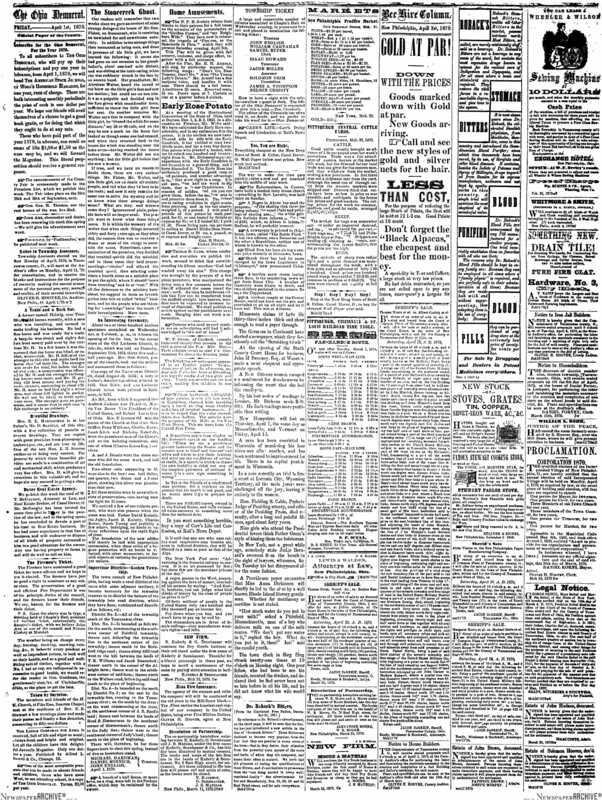 And hoping, of course, the newspaper chronicling the lives of your loved ones hasn’t adopted the same abbreviated style as, say, the Pittsburgh Post-Gazette, which hadn’t changed its basic name, died, funeral date and place format in the 98 years between my great-great grandfather Morgan’s death in 1897 and the death of his granddaughter in 1995. But here I go burying the lead. Fewer links ahead, promise, and a thorough peek into the life of Sherman’s daughter, Grace Foutz Chaney. 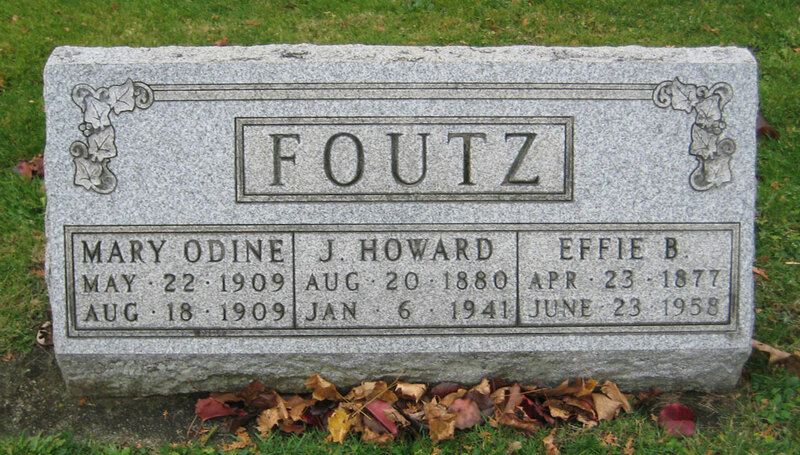 The central tragedy for Sherman Foutz’s family was his early death, at 47, of tuberculosis in 1915. Following that, the first of our Foutzes to leave the farm in Harrison County, Ohio, attend college and work in the big cities of Washington D.C. and Reading and Harrisburg, Pa., essentially split up. Eldest daughter Grace marries that December in a West Virginia county neighboring the one a lot of our other relatives seemed to elope to (probably a story in itself). 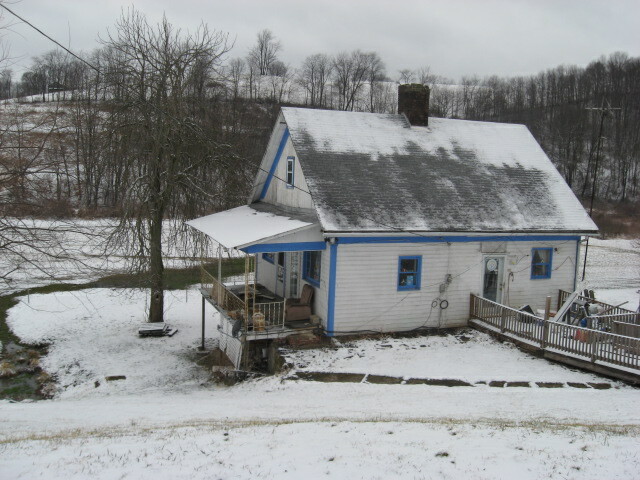 She lives the rest of her life not with her mother, Elizabeth Foutz, or step-sister Catherine, back in Harrisburg, but with husband Fred Chaney in Uhrichsville, where she works as a school teacher. They never have children. They never leave Uhrichsville. And they have an odd propensity for consistently lying about their ages. In fact, Grace’s gravestone is off by the same incorrect six years as most of the censuses, which made her, for a time, the same age as the six-years-younger Fred, and which was maybe their point in fibbing. But never fear: Grace’s 1970 obituary finally gets her age right, and spills the details about a lot of her life. We learn Fred precedes her in death by 15 years. Older brother Oscar is also listed as deceased. Then there are the tantalizing hints of “several nieces and nephews” and that foster sister, Catherine Rutt, whom we haven’t found out a lot about yet. 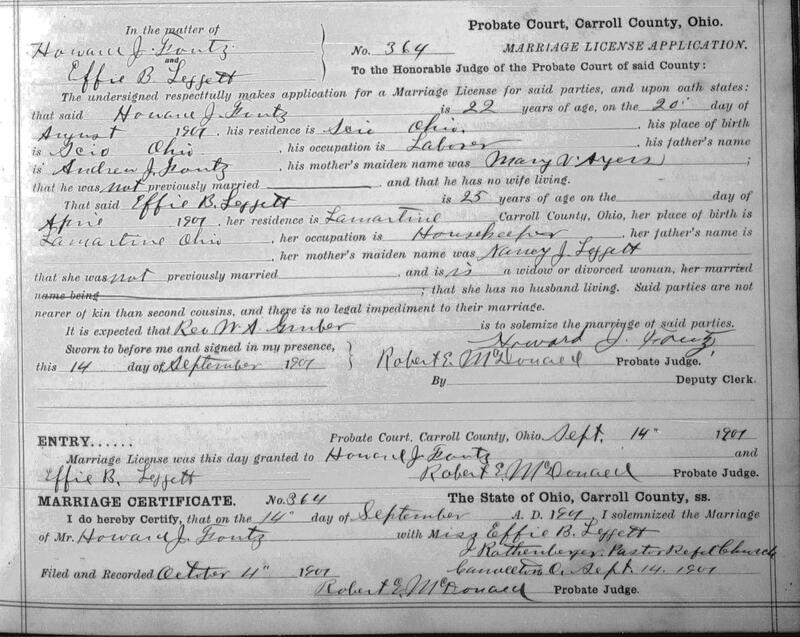 Why did Grace marry an Ohio man just eight months after her father’s death? Where and how did they meet? Why did Grace suddenly and emphatically live so far removed from her widowed mother, young foster sister and the remnants of her brother’s family in Pennsylvania? And, living as she did just a dozen miles south of her extended family (my own) in Dover, Ohio, did she maintain connections with the greater Foutz clan? On this last point, the written record seems to suggest Grace knew about Vance Foutz’s family in Dover and kept up with my great-grandfather, her uncle in family relation, but really just three years her senior and one year Oscar’s, an accident of the 20-year span between bookend brothers Sherman and Vance. In fact, when preteen Vance, Oscar and Grace lived together in Washington D.C. about 1900 (family lore has recorded that Sherman got his youngest brothers John, Charley and Vance jobs in the postal department), they were likely more playmates than proper uncle and nephew and niece. That Vance’s and Grace’s birthdays were also close together (hers, Sept. 5, 1890; his, Sept. 7, 1887) could also have been a fun circumstantial bond. Also a brother Sherman that we know little about, and possibly another sister (Louise wrote). … I went to Pop’s sister’s funeral when I was pregnant with Donna. A Frank Coleman used to visit often, and a niece that lived in Urichsville (sic. ), and some red-haired nephews from Canton. Neither Doris or I remember names. The red-haired nephews likely belonged to Charles Foutz, who died of pneumonia in 1918 at age 32, leaving a wife and four children behind. (More on them soon!) The niece is most likely Grace. An examination of great-grandpa Vance’s funeral guest register shows the shaky hand of 78-year-old Grace Chaney as present. Pity, then, that no one from my grandparents’ generation remembers Sherman’s dynamic daughter. Fortunately, a newspaper article from the same Times-Reporter, a year before her death, tells more of Grace’s story. A January 25, 1969 feature entitled “Wonderful Life…” details Grace Foutz Chaney’s childhood and education, her marriage to Fred, her teaching career and the ways she lived out her days in Uhrichsville. Read the whole article by clicking the thumbnail below. 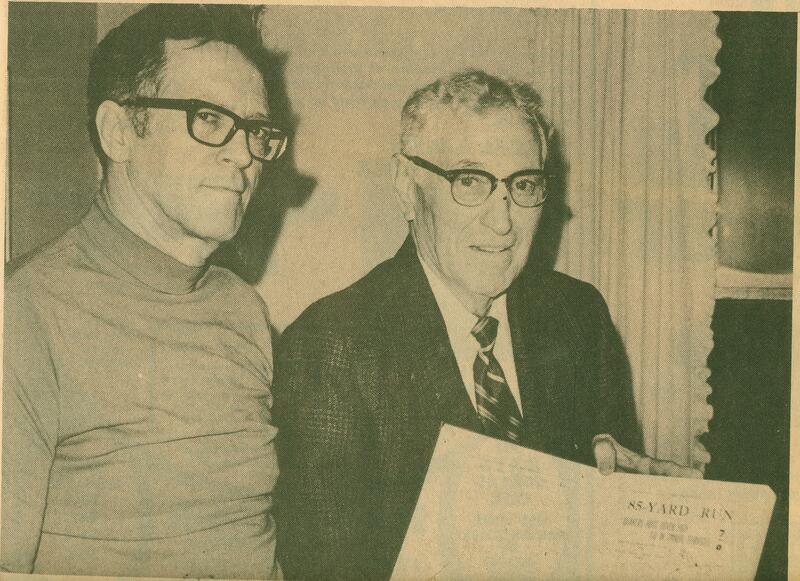 Grace Foutz Chaney’s life is detailed in a January 1969 Times-Reporter article. After the family’s move to Reading, Pa., she attended private girls’ school and, like her father, became active in the Knights of the Maccabees. At 15, having just completed 8th grade, she took a “sub-Freshman” test and was granted admission to Irving College. Though Grace never properly graduated high school, she spent 5 years at Irving, graduating with a “bachelor of science degree for teaching, Latin, English and problems in democracy.” She was also granted a teaching license in Pennsylvania. Grace was granted a teaching certificate in Ohio (as well as 2 lifetime certificates for teaching grade and high schools) and taught for 40 years in Dennison, Tuscarawas, Harrison County, Conesville and Feed Springs. She never served as a substitute, only taught full-time. The article also details some family highlights, even if the facts seem dubious or outright incorrect. On brother Oscar, the article reports him as having died in 1945. An interesting — though perhaps false — match to mother Elizabeth’s death year. As to husband Fred Chaney, the article reports Grace met him when she returned to Ohio for her grandmother’s funeral “in May 1916.” The death of Rebecca Foutz may, indeed, have been the occasion Grace and Fred met, but sources tell us Rebecca died in May 1915, same year as Sherman, and same year as Fred and Grace’s marriage that December. The article shares Fred’s occupation as railroad conductor, and gets his death right, in September 1955 (coincidentally, on Vance’s birthday). And shares the location of their first shared, and later, Grace’s solitary residence in the Nicola Building at 3rd and Water streets. Grace’s wonderful life, though illuminated in interesting ways, still is in many ways a mystery. But with some of the clues revealed there, we fill in a few more blanks. More answers to come. Grace Foutz Chaney made her home in the Nicola Building in Uhrichsville for more than 30 years. Did Oscar Foutz Outlive His Father? 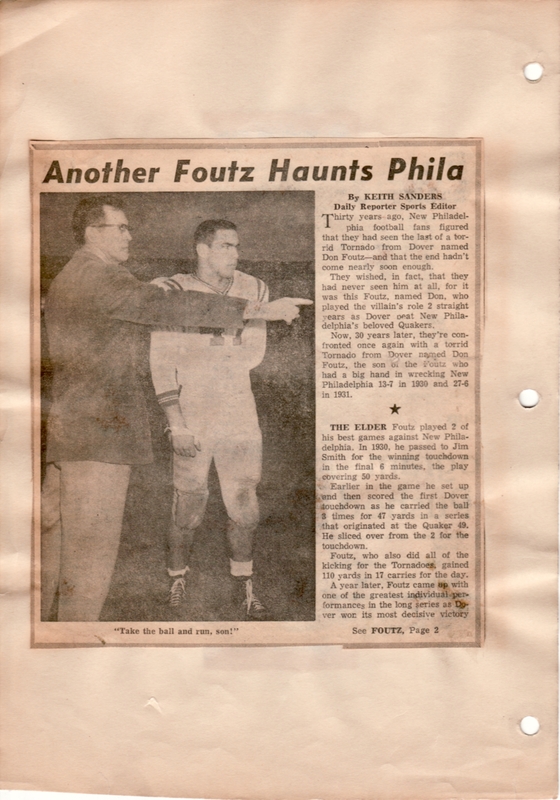 Sherman S. Foutz, oldest brother to Colt’s great-grandfather, Vance Foutz. Genealogy — thorough, mystery-revealing genealogy, anyway — never unfolds in a straight chronology. Our look into the latest revelations of the lives of my great-great uncle Sherman Foutz’s family continues this week with a bit of family history time travel. 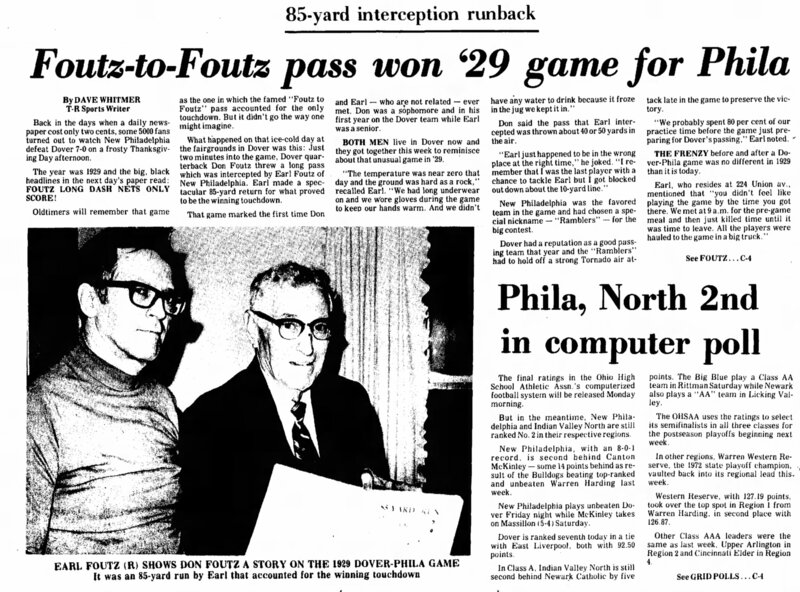 His elusive son Oscar Foutz is today’s focus. Like life, in which we age in a progression of days and weeks and years, but bounce back and forth in our memories, the time-travel leaps of an active, living mind, genealogy doesn’t reveal its deeper secrets by merely starting at birth and ticking off milestones until death, burial, fill-in-the-blank on the tree. You often have to start at the end of a life to understand the relative you’re researching, the places they’ve lived, the things they’ve done, the people they’ve loved. Obituaries are — usually — rich troves of the essentials you need to merely confirm that who you’re trying to get to know is, in fact, the family member you’re looking for: birth date, parents, hometown, occupation, spouse, surviving children and siblings, those who preceded them in death. Filling in the blanks, and ticking off those necessary confirmations, means flipping back and forward through multiple sources to reveal a life lived long after it has ended: birth certificates, census records, draft cards, marriage certificates, gravestones, newspaper clippings. Often, if you can’t start at the end of a life, you lose the threads which connect you, through history, to its beginning, not to mention its meaningful middle. 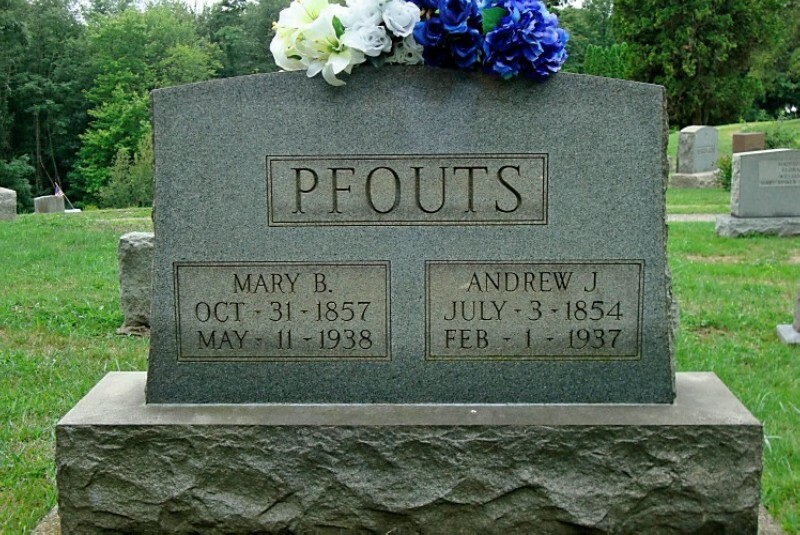 For a long time, I’d assumed Oscar Foutz, nephew of my great-grandfather Vance Foutz, had died even before his father, Sherman, succumbed to tuberculosis in 1915 at a too-young 47. The main reason? Sherman’s yellowed obituary from that April, which my great-grandfather still possessed when he died some 53 years later, lists only his wife and daughter, Grace, as survivors. Adding to Oscar’s challenge as genealogical cipher, are the odd notations in censuses — and his eventual, utter absence from these records. Jump back 5 years from Sherman’s death. The 1910 census spotlights the family in its Harrisburg prominence. Living at 1908 N. Third St., the household is headed by a 23-years-married Sherman and wife Elizabeth. Oscar, 21, has worked the entire year as a railroad fireman. Grace, 19, is out of school, but not employed. And there, a bit of the cryptic: A 1-year-old grandson, Ralph, is also among the household. And Oscar is listed as married two years. But his wife is not living with the Sherman Foutz family. At first, this led me to wonder if Ralph’s mother — Oscar’s wife — may have died young, perhaps in childbirth. Though, if that were the case, why would Oscar be listed as married two years and not widowed? Over the last few years, I filled in some of the gaps, discovering Oscar’s marriage to Florence Hartman in September 1908 (after applying for marriage Jan. 1 that year — Ralph was born Dec. 19); discovering the birth of a second son, Harry Sherman, in March 1910; Florence’s visiting Oscar at a National Guard camp in July 1911. But if finding Florence missing from Oscar and Ralph’s home two years into marriage is puzzling in 1910, by 1920 both parents — and Harry Sherman, for that matter — have vanished from the usually helpful census map. Skipping five years after Sherman’s death, the 1920 census finds 11-year-old Ralph Foutz living in the care of his grandmother, Sherman’s widow, Elizabeth. A foster daughter, 14-year-old Catherine, is also listed, and Grace is listed, but then crossed out. Further research turned up Grace’s marriage 8 months after Sherman’s death to Fred Chaney, in what looks like a West Virginia elopement since no family is listed. The couple turn up in Uhrichsville, Ohio, near Sherman and Elizabeth’s birthplace, in the 1920 census. So why is Grace mistakenly entered (and first reported) in the Harrisburg household? The family by 1920 has changed addresses, living now at 59 North Tenth St., where they host two boarders and Elizabeth works as a cook for the Elks Home. Harry Sherman is not listed; nor is Oscar; nor is Florence. What happened to Ralph’s family? With Sherman’s death such a tragic, distracting shadow in my research, I wondered if a September 1910 Gettysburg Times articleindicated trouble for the family. The article reported that Oscar W. Foutz, of Harrisburg, after receiving his pay as a soldier in the National Guard, went to Allentown with three other men for a night on the town. While making the rounds, a man named William Croghan crossed their paths, was hit with a club and relieved of his valuables. One of the men in Oscar’s party plead guilty and was sentenced to 2 years. Oscar also confessed and got nine months in prison. Now, Florence would visit him in National Guard camp the next year, indicating, it seems, Oscar’s reinstatement and the family’s continued unity. Though where was she in 1920? 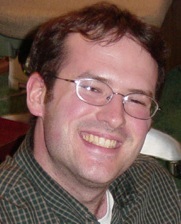 Where was son Harry Sherman? 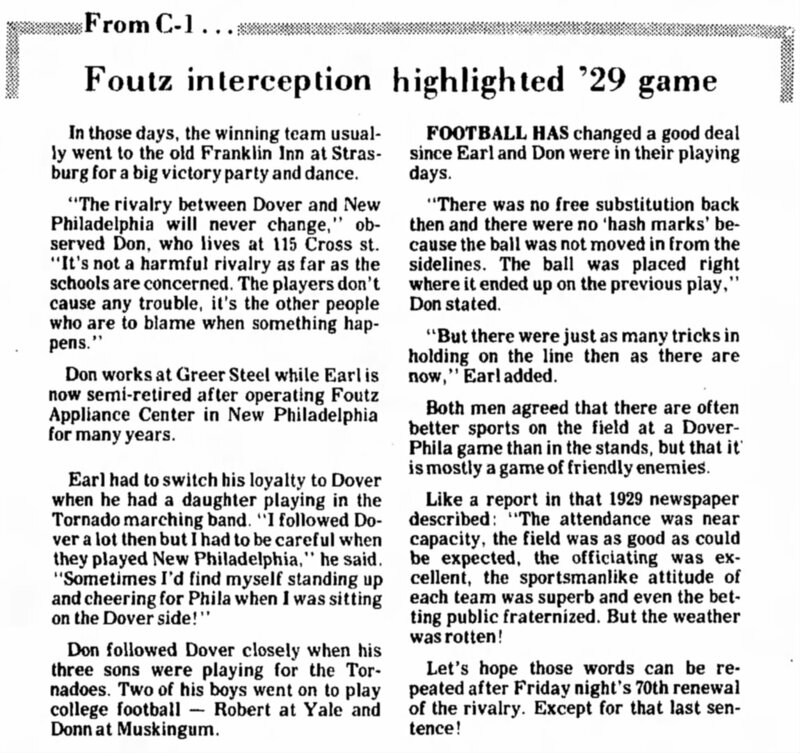 And what became of Oscar Foutz? Did Oscar succumb to tuberculosis like his father? One of Sherman’s (and my great-grandfather Vance’s) nephews, Karl Coleman, also dies of tuberculosis a month prior to Sherman back in Ohio (in the home of Vance). Did Florence and the baby die of it as well? Reading tea leaves, 100 years distant, is an imprecise business. Death, an easy explanation, can distract. And incomplete records fail to illuminate, and instead lead astray. In my research this winter, suddenly, an open door. Oscar lived. Obituaries are often preceded by shorter death announcements. The same was true of Sherman Foutz’s death, only recently discovered. As reported in the Tuesday, April 6, 1915 edition of the Harrisburg Times, Oscar is not only listed as a survivor, but living, by then in Arizona! What do we know of Oscar — and the rest of Sherman Foutz’s family and descendants — in the years that follow? More to come…. 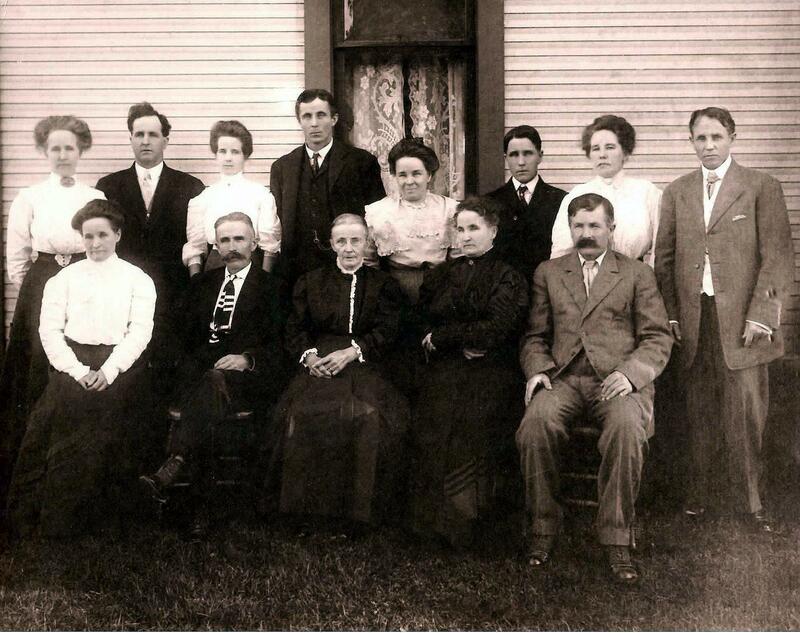 The sons and daughters of Sarah Ann (Walters) Fisher gather for a portrait with their mother in the early 1900s. Front: Sarah M, John William, Sarah Ann (Walters), Mary Jane “Jennie”, Henry. Back: Emma, Ellsworth, Della, Barclay, Lily, George, Clara Alice, James. 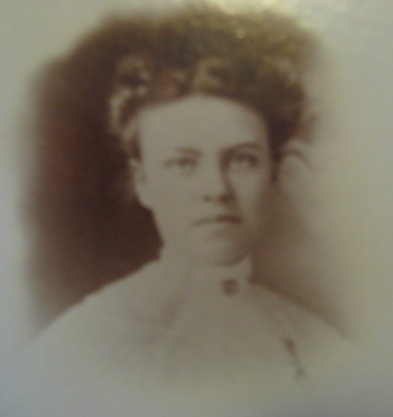 Today’s dispatch comes courtesy of the alert eyes of Ancestry.com connection — and relative somewhere back through all those Leys and Weibles — Judy Schrock, who last month spotted an article in my old hometown paper about an alleged haunting nearly a century and a half ago. At the heart of this tale of witches: a 9-year-old third-great aunt, Mary Jane Fisher, sister to my great-great-grandfather John William Fisher. The family called 104 acres of farmland just outside of New Philadelphia in Stone Creek home. George’s father, Henry Fisher, first settled in the area about 1818, according to The History of Tuscarawas County, published in 1884. Through proceeds from day labor, Henry slowly built his savings and eventually acquired 166 acres. The Fishers were well-connected — and intermarried — with several prominent early farming families south of New Philadelphia, including the Crites (Elizabeth Crites, daughter of Revolutionary War soldier, Jacob, was Henry’s bride) and Walters clans. George married Sarah Ann Walters, whose parents, Abraham and Mary Walters, maintained their nearly-200-acre homestead just south of their own. In addition to helping raise a large family of 13 children, George served the community as school director. So when in March 1870 The Ohio Democrat reported the first inklings of their daughter Jennie’s encounters with “strange persons and things that other persons who are present do not see,” the rumors were not dismissed out of hand. “Reliable men from the neighborhood say the story is not without foundation,” the paper noted. We have strange rumors from Stone Creek. … Windows are broken, when apparently no one is there to break them. A person riding a white horse (Death on a pale horse) has been seen. Sometimes a dog, invisible to vulgar eyes, is seen by this fortunate little seer. … Some pious people say the little girl is ‘bewitched,’ others that the house is ‘haunted,’ and some more silly still, assert that spirits have ‘a finger in the pie.’ Of course, the latter explanation finds but few believers. The mystery got further treatment in the Ohio Democrat of April 1, 1870. Baker recounts the tale of Jennie being slapped by an unseen hand while dining at her grandparents’ house, and of joining her grandpa Abraham Walters in chasing a witch nearly 300 yards (50 or 60 rods in the original — thanks, Google, for confirming Baker’s handy calculation) across their farmland. Her grandfather, Mr. Abraham Walters, heard the sound of the blow on the little girl’s face and saw her motion, but could see no one else. It was a palpable and decided slap in the face given with considerable force, sufficient to throw the little girl from her seat. … During the chase (of the witch), (Abraham Walters) saw a mark on a fence that looked like someone had crossed it. When they got back to the house, the ‘witch’ was standing near the bake oven. Mr. Walters did not see anything, but the little girl insists that she saw a woman. According to Baker, the Democrat never followed up on the story. 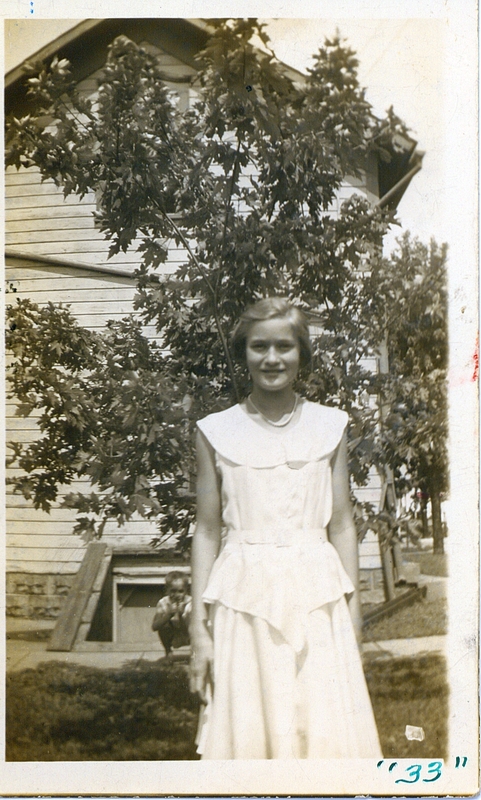 What became of Aunt Jennie Fisher, in the years after her childhood encounters? The record remains silent on any ghostly activity. But the Democrat reported her marriage Dec.13, 1883 to William H. Walters. 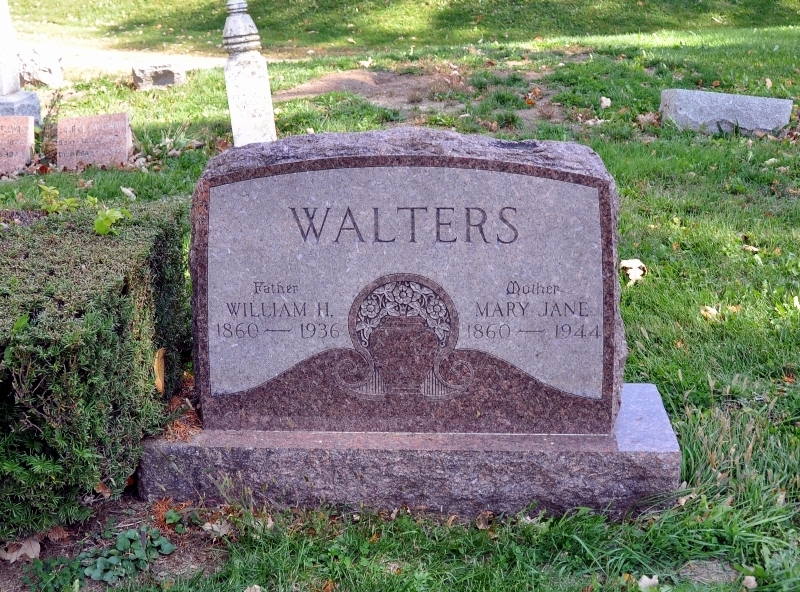 No word on whether this Walters was a relation to her mother’s family. 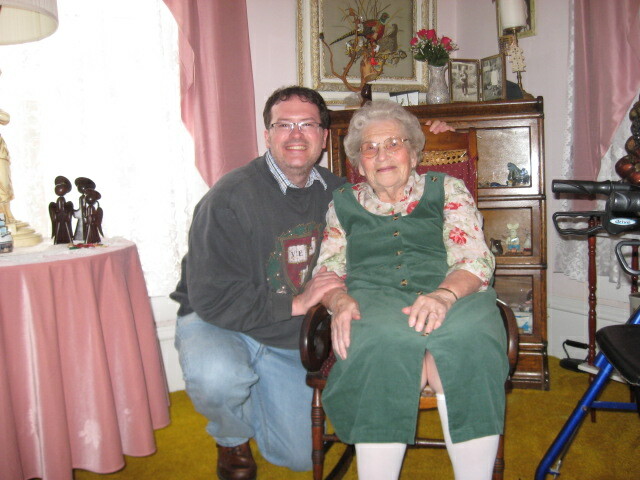 But the article notes William came from Van Wert, Ohio, where the couple makes their home for the next six decades. Oddly, the same census records that confirms their residency in Van Wert also shows a Mary J. and William Walters living there together, with an infant son, as early as 1880, some three years before the Democrat reported their union. But then, the 1900 census seems to peg their marriage year as 1877 (the document reports 23 years of marriage, which would mean they wed as teenagers), while the 1910 census corrects the record to 26 years, or very likely the late 1883 date reported in the Democrat. The couple live out their days in Van Wert, raising five children (six, if that early census is to be believed). William passes away first, in 1836, while Jennie (Fisher) Walters lives to the ripe age of 83. She dies Jan. 6, 1944 and is buried with her husband in Van Wert.